It seems strange, somehow, to be labeling a building that was built in 1989 as a classic. 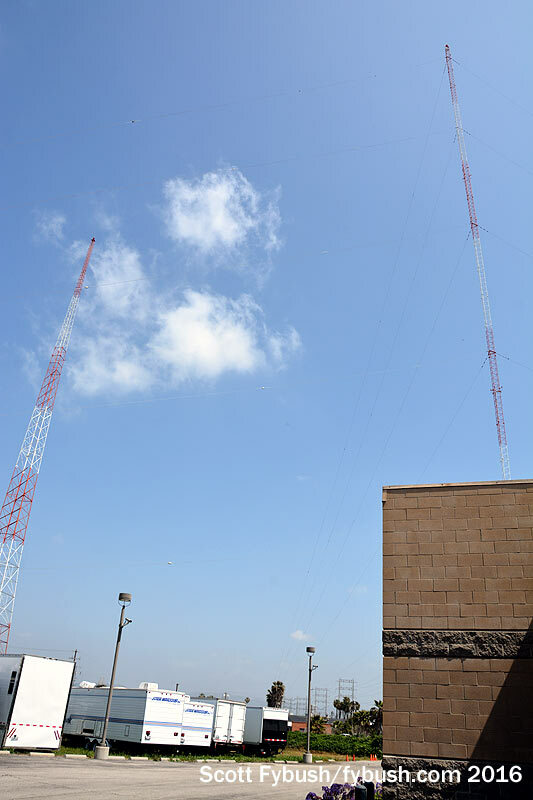 But as we prepared to walk inside the KABC/KLOS studio facility on La Cienega in west LA for the last time in April, there was no doubt that we were saying goodbye to one of the last broadcast facilities like this one that still stands in the fast-changing Los Angeles market. Consider: when this dramatic curved building went up to replace an earlier studio compound that sat right on the La Cienega frontage, there were plenty of “classic” broadcast studios still in use around town. RKO’s KHJ/KRTH was just a few blocks north on Venice Blvd. 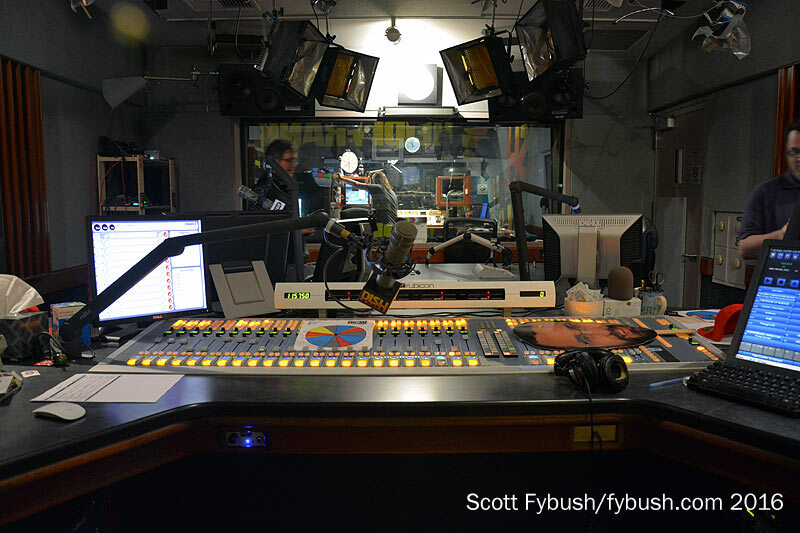 (and today, as CBS Radio’s KROQ/KCBS-FM complex, may be the last of its kind.) CBS, for its part, still had KNX and then-KKHR ensconced in the Art Deco Columbia Square. KFI was just moving from its Deco home on Vermont Ave. to Koreatown. And ABC? ABC was flying nice and high itself at the time. 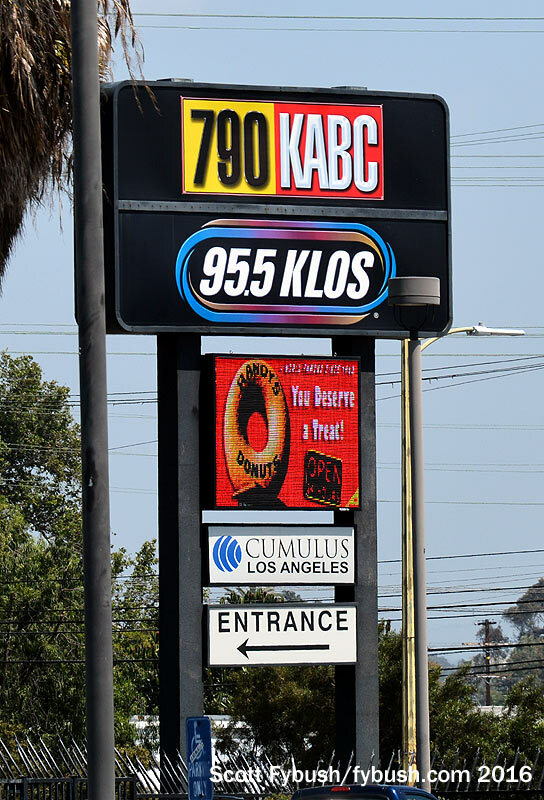 Despite a relatively anemic 5,000-watt signal, KABC (790) was a major force in talk radio in market number two, while rock sister station KLOS (95.5) matched it dollar for dollar in profitability. The new building went up in three parts: a studio pod at the center, with offices for KABC and KLOS curving off on either side. 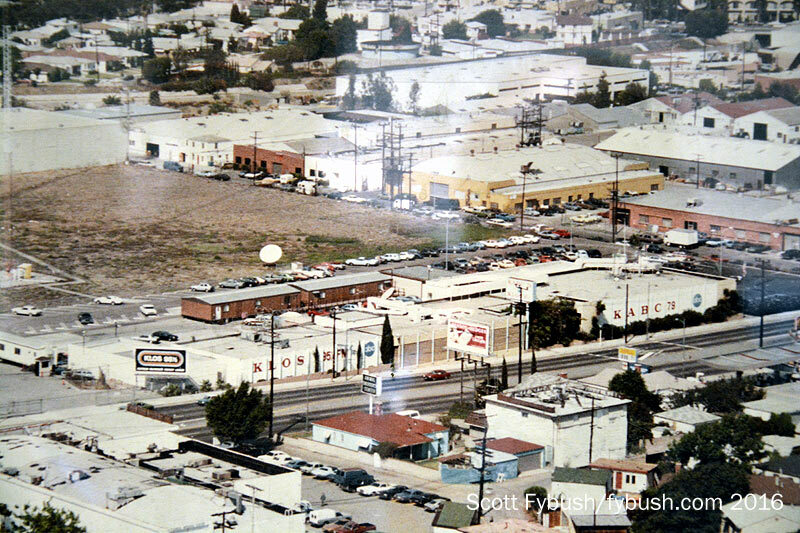 When it was done, the old building was torn down, creating some open space fronting La Cienega and eventually a big curving parking lot under the AM towers. 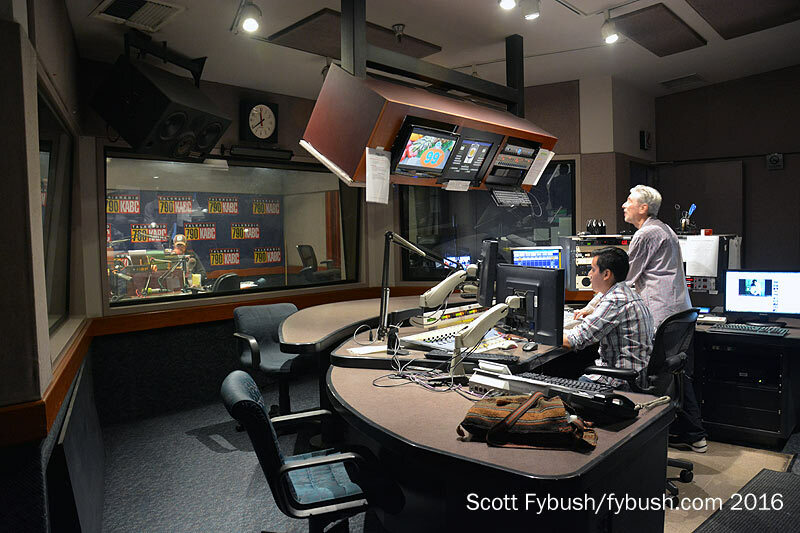 It’s safe to say that absolutely nobody, save perhaps public radio, builds studios these days that are as majestic as the KABC studios that ran along the rear of the center part of the new KABC/KLOS building. Slanted walls, slanted ceilings, heavy doors, those oh-so-1980s overbridges crammed with mod monitors and the like – and all that wood, too, plus two (count ’em) booths adjoining each studio for call screeners and news anchors…they were things of beauty, weren’t they? The original design here had PR&E consoles throughout; in the main studios, those have now given way to newer SAS Rubicon boards, which still look like a million bucks in these rooms. 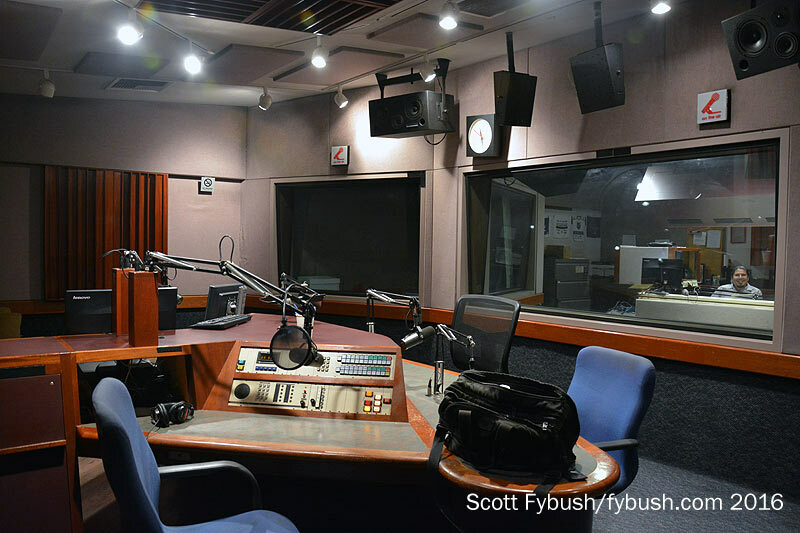 And did we mention KABC had two of these studio complexes, plus several smaller studios? 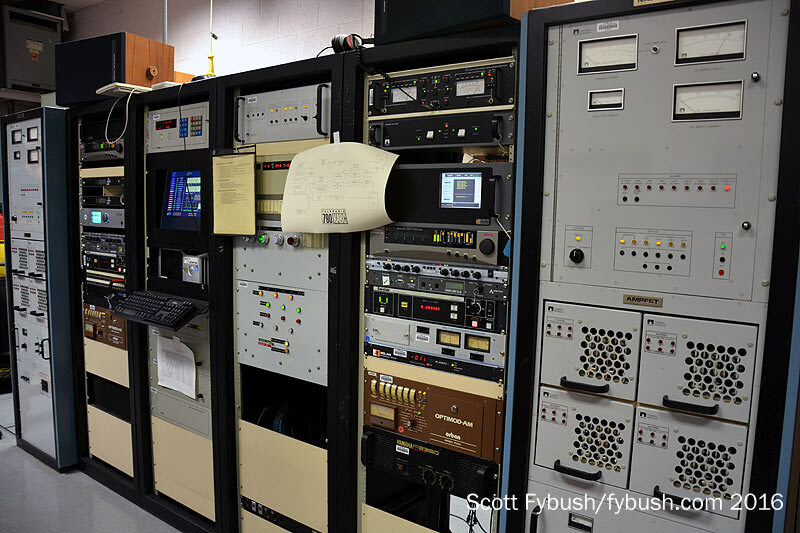 It came in handy for a few years when ABC added a second station here – the old KMPC (710) became KTZN for a while, then KSPN as the West Coast flagship for ESPN Radio. 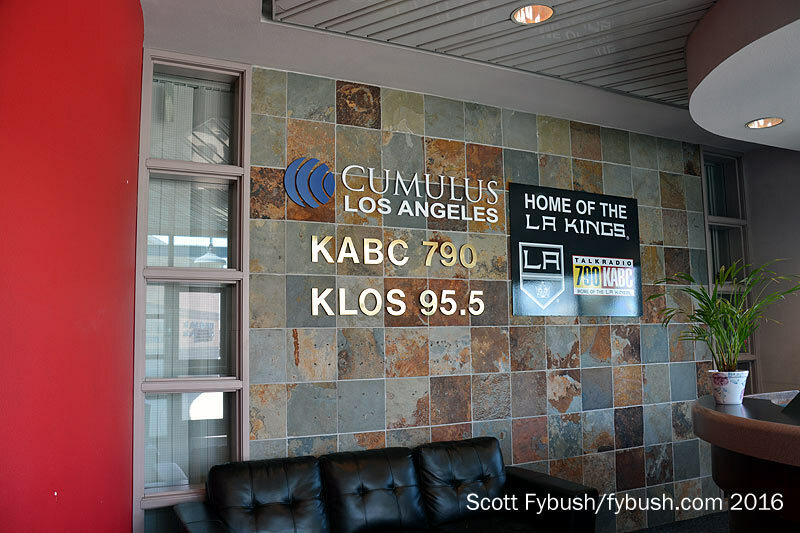 Disney’s eventual selloff of ABC Radio to Citadel and then Cumulus meant KSPN eventually moved downtown to the LA Live complex, leaving behind some increasingly empty studios here. 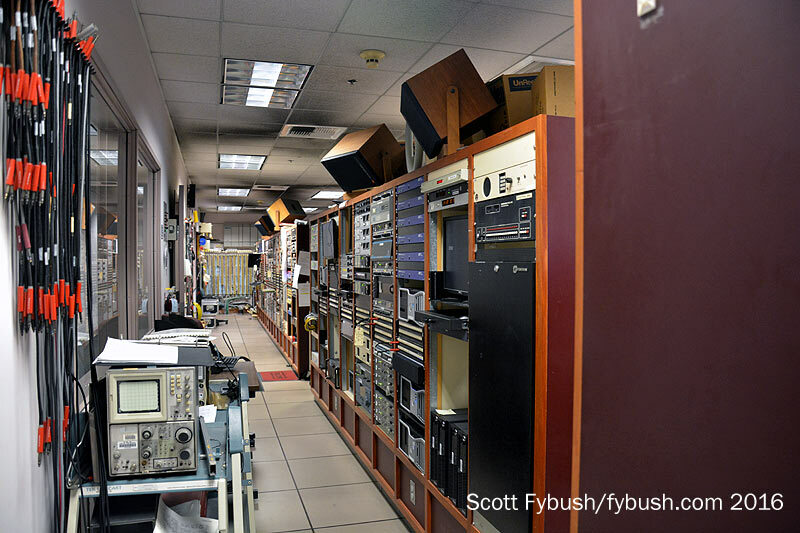 More “they don’t build ’em like that anymore”: check out those oh-so-80s racks in the rack room – and behind it, not visible here, the skeins of point-to-point analog wiring that connected it all to the studios throughout the complex. There are several generations of gear in those racks now, including a pretty hefty SAS router system that’s helped to bring things more up to date here in recent years. KABC’s newsroom is just down the hall from the rack room, and from here you can take a detour through one of the sales/office areas to a hallway at the far end of the building where the KABC transmitters, a pair of Nautel AMPFETs, hum merrily away in a neat row opposite the fairly simple two-tower phasing system. 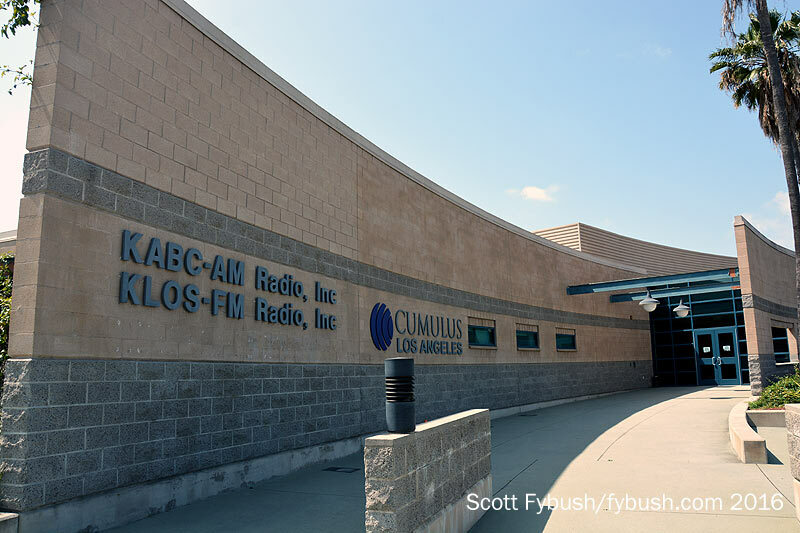 In this age of clusters, Cumulus ended up with just one FM in LA, and the legendary KLOS has plenty of space along its own hallway adjoining the KABC studio complex. 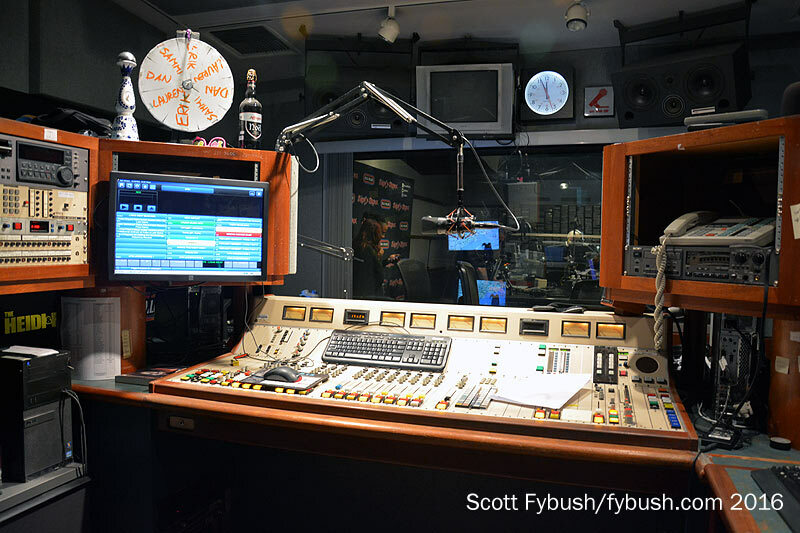 There are two pairs of big studio/control room complexes here, one (above) used primarily for the morning show (and its TV appearances on “Dish Nation”), the other (below) used the rest of the day. Yes, that’s a wall of carts at the back of the main air studio; no, they don’t get used on the air these days. 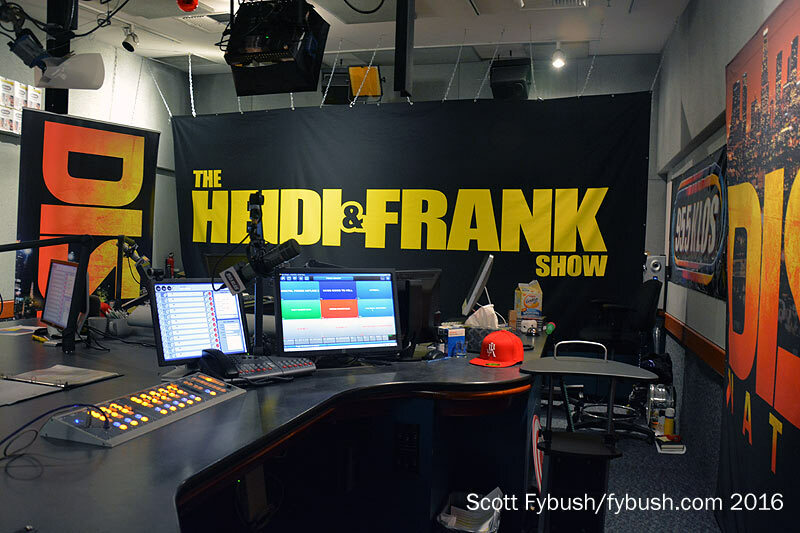 A production room at the end of the hall rounds out the KLOS side of things here; there’s the obligatory big sales/executive office area for FM off at that end of the building as well. 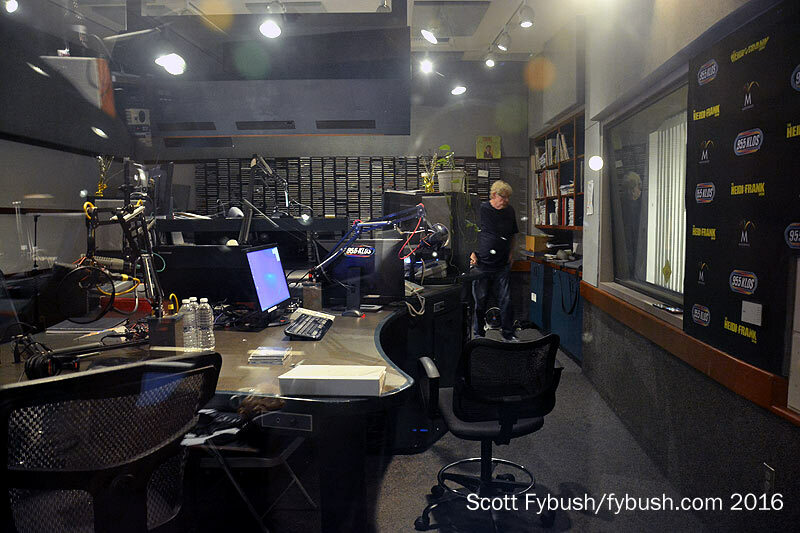 And with that, we say farewell to this icon of Los Angeles radio, probably for the last time. As you read this in the autumn of 2016, construction is underway nearby at the former Westwood One studios in Culver City for a new home for KABC and KLOS. Why the move? 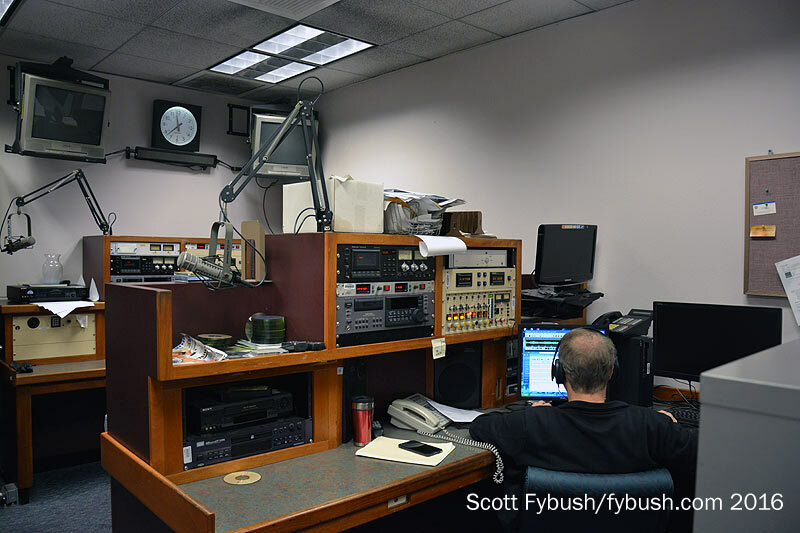 Money, plain and simple, as Cumulus looks to monetize some of the real estate it acquired when it bought Citadel and the former ABC Radio O&Os. This land may not have been worth much of anything when Hearst built KEHE here 80 years ago, and it was still a fairly gritty industrial area when ABC rebuilt the plant here a half-century later. The last few years, however, have brought big changes here. The new Expo Line train runs just south of the KABC property, linking downtown LA to Santa Monica, and that’s sent values here through the roof. After Cumulus sold the land here (for a reported value around $90 million), the plan is to build out more than 1200 residences and 300,000 square feet of retail on this land – and so time is now short for the radio stations to vacate. 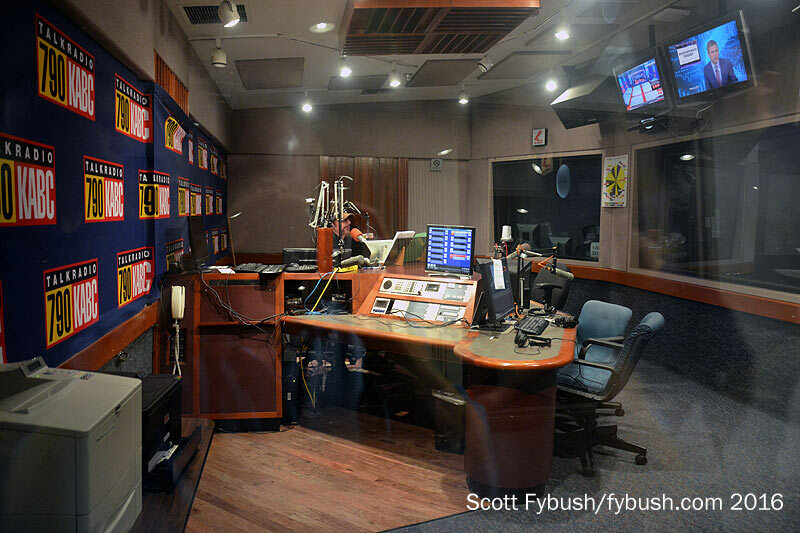 Within the next few weeks, KABC and KLOS will sign off from this space for the last time. Not long afterward, KABC will build out its new transmitter facility just over a mile away, diplexed on the shorter towers of KWKW (1330). As soon as that’s done, the 790 towers will come down, and this property on La Cienega will go silent on the airwaves for the first time in more than eight decades. Thanks to KABC/KLOS’ Mike Tosch for the tour! And don’t miss a big batch of Southland IDs next Wednesday, over at our sister site, TopHour.com!